“The disenfranchisement of our residents will profoundly affect our community,” Westpointe Community Council Chair Dorothy Owen says. But, in essence, that's what Senate Bill 234—sponsored by Sen. Jerry Stevenson, R-Layton, and Rep. Francis Gibson, R-Mapleton—did.Even folks living in the city seem to be only marginally interested in developing that corner of town. But ground is breaking at full-steam, and the lack of enthusiasm of residents in, say, Sugar House, is more than made up for by city and state leaders. In other words, officials see northwest quadrant development as economically important, but unless you stand to gain somehow, you're probably reserving your cognitive bandwidth for other things. Zooming down Interstate 80 on your way to West Wendover's roomie, privately run liquor store, it's possible that you've spent a little time in Salt Lake City's northwestern-most neighborhood—a place (likely also unknown to you) called Westpointe—but not much. Unless, that is, you live in Westpointe. Dorothy Owen is a resident and chairwoman of the neighborhood community council. Like most people, she takes pride in her town and is wary of the decisions outside politicians make that have the potential to change its face. "It's our home—to people who are blacksmiths, who are entrepreneurs, who run restaurants," she says. The ultimate goal of SB 234 is to ensure the creation of an inland port—a hub where freight from the West Coast will be processed and sent on its way to other destinations. If all goes as expected, open space in the northwest quadrant will fill in with light industrial businesses. As that becomes a reality, Owen and her neighbors want to make sure their voices aren't lost. "We're very concerned that our rights are being taken away and decisions being made about land-use planning are being usurped by the state government with SB 234," Owen says. "The disenfranchisement of our residents will profoundly affect our community." It's a familiar refrain: people are protective of their backyards and like to have a say about what goes in them. That's consistent. What changes, some residents point out, is the attitude of lawmakers who side with locals in some instances but not in others. Case in point is the 2017 debate over the Bears Ears region of Southern Utah, when some of the same lawmakers who support the inland port authority resolutely called for more local control. The mantra reiterated by state officials over and over was that the government should listen to those closest to the land when it comes to policy decisions. 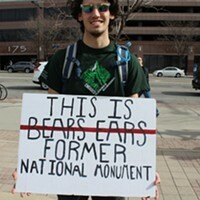 The San Juan County Commission, and Monticello and Blanding city councils, were afforded profound deference when a controversial national monument was declared in their neck of the state. The state's insistence on creating an inland port authority has not only rankled residents, but city leaders as well. Nevertheless, Gibson made his final plea on the House floor on March 7, asking that his colleagues pass the bill while acknowledging the city's disapproval. "Does the great Salt Lake City agree this is a good plan for them? Probably not," he said. "But I would argue that the State of Utah feels like we could do more." To call the tension between the city and state a battle, though, is to gloss over the subtleties of the dispute and mischaracterizes the issue: Both sides are in favor of developing the northwest quadrant. That's not the rub. The fight is over who's in charge. Plus the city, which has been negotiating with landowners on zoning changes for at least two years, doesn't want to give up its taxing authority. On March 2, City Council Chairwoman Erin Mendenhall took the stand during a Senate Economic Development and Workforce Services committee meeting to say that the city was poised to approve an inland port whether or not the state hopped aboard. She emphasized that the city wasn't relying on the state's help. With that said, the city wasn't eschewing some form of partnership, Mendenhall added, as long lawmakers didn't throw in "dangerous components" that take away the city's taxing and land-use authority. "As drafted, this bill would be an unprecedented encroachment on the core municipal functions," she said. Salt Lake City Mayor Jackie Biskupski warned that land and zoning appeals would be decided by the authority's board members who lacked the institutional knowledge of city planners. The board could also usurp and supersede city ordinances, she declared. "Instead, an unelected and unaccountable board would have the right to override the city's administrative land-use decisions—not based on fair and equitable standards but instead based on the board's opinion that the city's land-use decision does not achieve the board's goals for developing the inland port," Biskupski testified. By the end of the legislative session, the bill's final version left city leaders scratching their heads. It didn't alleviate any of their concerns. "In a matter of a mere 30 minutes, the Senate and House passed a bill that eliminated the City's land-use authority, compromised environmental protections, and took all tax increment. This allows the proposed board to spend it without restrictions including outside Salt Lake City," the mayor's stated in part. 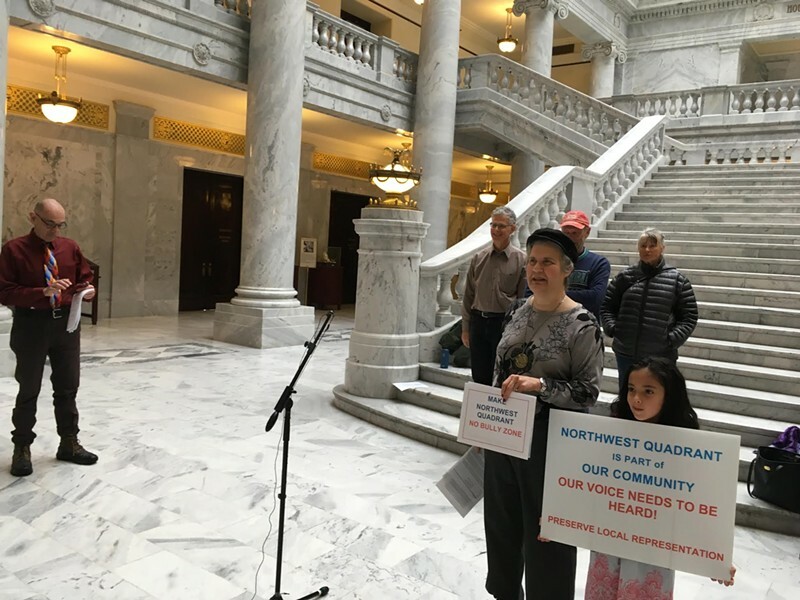 "The board's complete lack of accountability significantly undermines the ability of duly elected Salt Lake City officials to represent residents on critical land use issues. The City will no longer be able to make decisions on nearly one-third of Salt Lake City land. Yet the bill still leaves the City with the obligation to provide municipal services to the area, such as public safety and street maintenance, without a revenue source to pay for these additional services." City officials are now urging Gov. Gary Herbert to veto the bill. Two days after Biskupski testified against SB 234, members of the Westpointe Community Council, environmentalists and other activists gathered in the Capitol rotunda. Other than a couple TV cameras, a dozen or so supporters and a few gown-donning brides-to-be, the entire rotunda was dead. It was the last Sunday before the legislative session and not a senator or representative was in sight. Westpointe found allies in conservation groups that are trying to ensure fragile wetlands near the Great Salt Lake come out intact after the development dust has settled. City Weekly wrote about the unique bird habitat in a recent cover story ["For the Birds," Feb.15]. In addition to environmental groups, grassroots political organizations are also supporting Westpointe's cause. Ann O'Connell with the League of Women Voters of Utah noted that locals come out losers in the end. "Nobody has contributed to the discussion about this inland seaport—just very important people who will probably make a great deal of money, but nonprofits and the citizens of the city have had absolutely nothing to say and really didn't know it was coming," she says.